"Marine Geology" redirects here. For the scientific journal, see Marine Geology (journal). The study of littoral and deep sea sedimentation and the precipitation and dissolution rates of calcium carbonate in various marine environments has important implications for global climate change. The discovery and continued study of mid-ocean rift zone volcanism and hydrothermal vents, first in the Red Sea and later along the East Pacific Rise and the Mid-Atlantic Ridge systems were and continue to be important areas of marine geological research. The extremophile organisms discovered living within and adjacent to those hydrothermal systems have had a pronounced impact on our understanding of life on Earth and potentially the origin of life within such an environment. Oceanic trenches are hemispheric-scale long but narrow topographic depressions of the sea floor. They also are the deepest parts of the ocean floor. 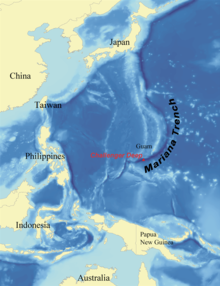 The Mariana Trench (or Marianas Trench) is the deepest known submarine trench, and the deepest location in the Earth's crust itself. A subduction zone where the Pacific Plate is being subducted under the Philippine Sea Plate. The bottom of the trench is further below sea level than Mount Everest is above sea level.